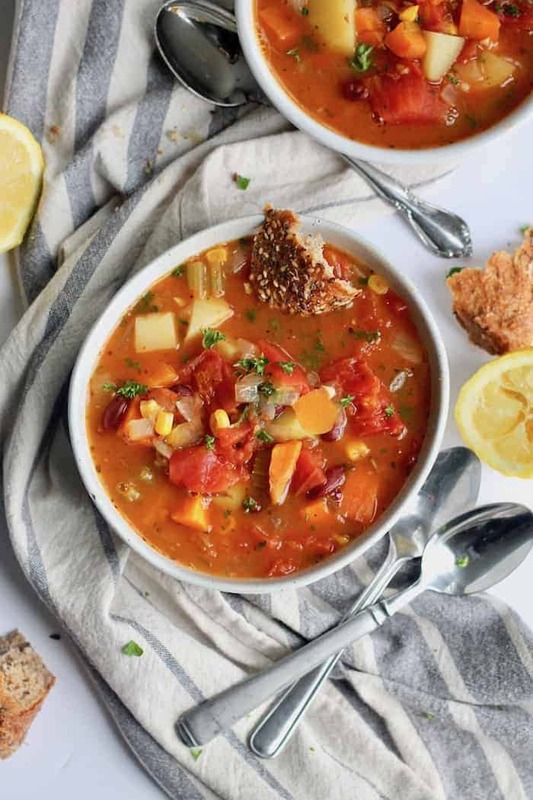 This irresistibly creamy one-pot Healthy Salmon Corn Chowder is super easy and packed with veggies. Dairy and gluten-free! ChowDUH. This soup is the bee’s knees. It’s fresh and hearty and creamy and wholesome all rolled into one giant dream boat. I’d hug it if the pot wasn’t so damn hot! Most recipes for corn chowder call for some combination of milk, cream, and cheese for that thick + creamy factor. And they work, quite well in fact! But you know I’m always up for the challenge to create meals that anyone and everyone can enjoy. 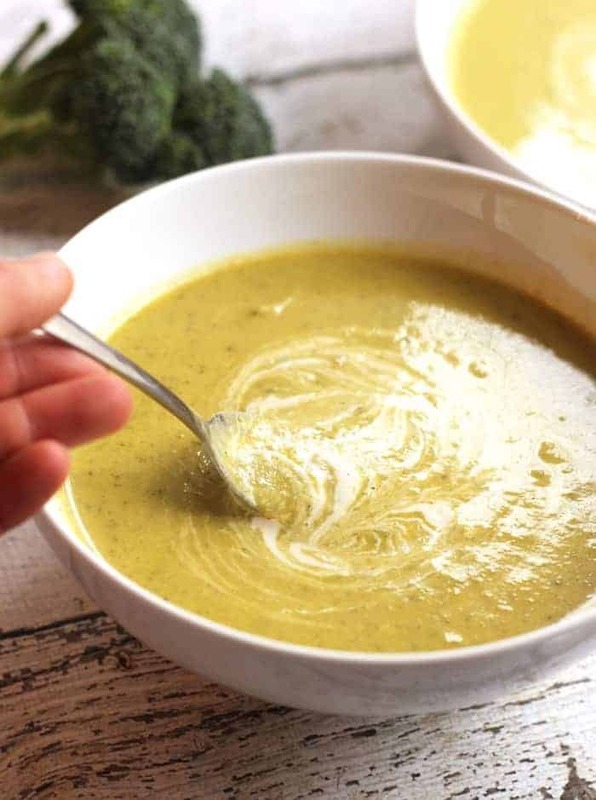 Whether you have a dairy intolerance or a personal preference or you simply like to play with foods in cool new ways like I do, this soup is insaaaaanely creamy thanks to the loveliest nut of all: the humble cashew. Definitely googled how to spell that one. So I have two funny things to tell you about this healthy Salmon Corn Chowder recipe. First, I know it would still be really delish sans salmon, whether you’re vegan or you just don’t have any on hand. I also think you could use canned salmon (just add it at the end since it’s pre-cooked). Sounds weird since salmon is in the title, but trust me—the lemon and dill and cashews plus all the veggies make a lovely soup in their own right. I’m going to make it again with double the corn and no salmon so I’ll let you know how it goes. Second, I took these photos with my iPhone. Lolz. Waaaa? It was kind of amazing. Basically I was standing on a chair per usual trying to get some good pictures of this chowda with my camera and it just wasn’t in the stars for me. It wasn’t light enough outside and all the pictures looked weirdly blue. Not to mention the fact that lately my camera doesn’t feel like focusing. I think I need a new one. Blerg. Anywho, your face deserves a warm bowl of this greatness!! It’s truly a one pot wonder meal. If you do indeed whip up a batch, be sure to tag me and add #hummusapien so I see it! One last word to the wise: do NOT leave out the lemon. Adding acid at the end of soup making is the key to that bright flavor that brings everything together. If you don’t have lemon, use a splash of vinegar. Soup on, good people. Soup on! 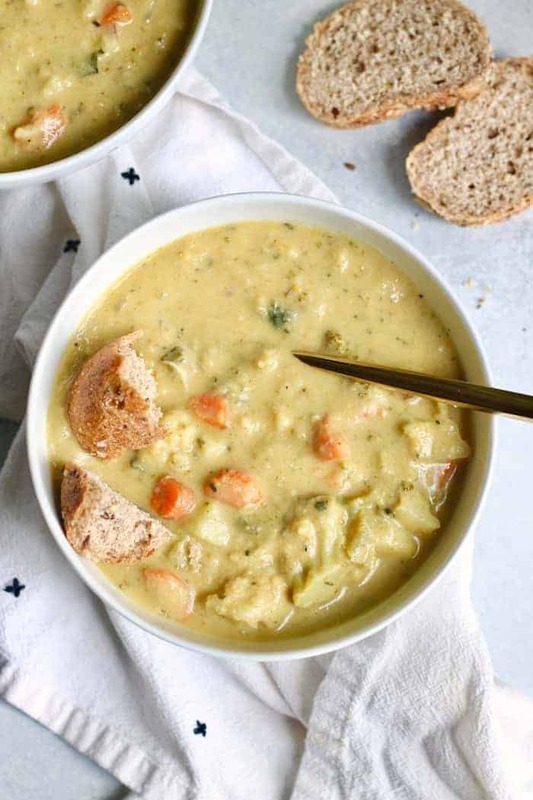 This irresistibly creamy Healthy Salmon Corn Chowder is packed with veggies and cashew cream for the tastiest, most comforting healthy soup. The best part is how easy this one pot meal is! Dairy and gluten-free. Place cashews in a small bowl and cover with water. Set aside to soak. Heat oil in a large saucepan or Dutch oven over medium heat. Add onion, celery, carrot and bell pepper plus a pinch of salt and pepper and cook for about 5-7 minutes, stirring often, until the vegetables soften. Add garlic and cook for another minute. Add potatoes, broth and corn and bring to a boil. Reduce heal to low and simmer uncovered for 20 minutes, or until potatoes are fork tender. Add salmon and cook for a few minutes, or until just cooked through. Remove pot from heat. Drain and rinse cashews. Blend with 1 cup water in a high-speed blender or Nutribullet until completely smooth and creamy. Stir into soup along with dill, salt, and pepper to taste. Add a big squeeze of lemon juice to bring it all together and enjoy! Sounds like the perfect dish for him! Let me know how you two like it! I absolutely LOVE salmon chowder!! My mom used to make it in the winter and it was sooo cozy. This recipe looks just like the chowder I remember, I can’t wait to try this one out :) . This recipe is AMAZING! I was amazed at how quickly the salmon cooked and how thick the soup got in the fridge! We paired it with a crusty sourdough. Definitely going to be a staple ! I’m so glad! Ya it cooks SO quickly. Crusty sourdough is everything!! Heheh! Lucky for you there’s no dairy or cauliflower in the soup but as far as the nuts, maybe try blending sunflower seeds instead? At first I saw the title and though, “ugh, chowder!” (I’m a traitor to my New England heritage). But THEN I read the recipe and I revised my take on it. I even wondered how this would be with some smoked salmon. I might need to make this while FL is still experiencing actual cold weather! Go for it! It’s seriously been such a blessing with these arctic temps. Do you have a Nutribullet? I use it for EVERYTHING! It’s about $80. I’m not sure how you’d get the creaminess without it unless you want to try a dairy alternative? Hope that helps! What is your favorite veggie broth? I’ve had some that add a really strong, almost stewed, herbal flavor, to recipes which has been a major bummer in the past. Better Than Bouillon Vegetable Base. It is the best one I’ve tried! Alexis! You really knocked it out of the park on this one! It came together so easily. The lemon is essential! I made it with canned salmon that had been sitting in my cupboard forever, and the cashew cream + lemon combo cut that canned fishy taste. Looking forward to making it again! Thanks love!! Yess the lemon is everything! It brings it all together so well. 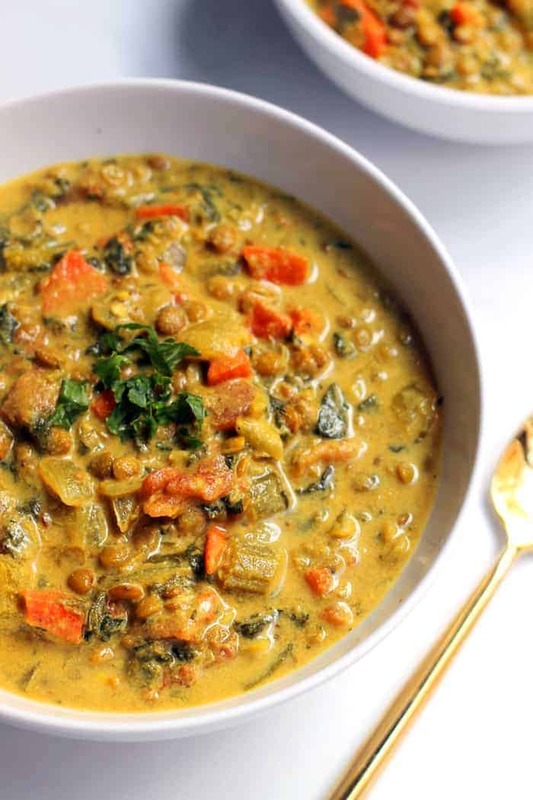 Here’s to new winter food staples! Yum yum yum, so excited to make this, hopefully before I embark to The Land of No Cooking (aka my dorm). Also, I’m so impressed with the photos! Did you use Portrait mode? I made this and it turned out great!! I couldn’t believe how easily the cashews blended together and it made it so creamy– YUM. The lemon was the perfect touch. I added a lot more dill than the recipe called for and also put a little cayenne in for some heat. Thank you for this delicious and creatively healthy recipe! Will definitely make again! How did it go with double the corn and no salmon? Can’t wait to try it!! It looks so delicious. I’ve never had salmon in chowder before. I’m definitely looking forward to trying it this weekend. Wow, amazing recipe! I used canned salmon and it was delicious. Have you tried freezing this? Thanks again for the recipe. Yay! It’s one of my faves, too. Loved it as well. Chowders seemed daunting to make. This was easy. Do you have the nutritional value to share? Great! Thrilled you liked the chowder. Sorry but I don’t calculate nutrition information. Mmmmm….made this tonight and it was simple to make & soooo good! Thank you for the recipe! One question: do you skin the salmon before adding it or let it cook then skin? Sounds amazing! Do you think this would work in a slow cooker? This looks amazing! I can’t wait to make this! Quick and silly question: What kind of salmon did you use? Fresh salmon or canned salmon like Wild Planet? If you use fresh wild salmon do you cook it at all before ? Thank you for all the awesome recipes! Hi! You can use fresh raw wild salmon (it cooks quickly per step #4) or stir in a can of cooked wild salmon (remove bones and skin) at the end. Enjoy!! SO delicious! 10/10 recommend making! Made this for dinner last night and it was amazing! To make it modified low FODMAP, I infused my oil with onion and garlic, then removes them before continuing to cook, omitted the celery, and doubled the bell peppers and carrots to make up some of the bulk. Turned out super satisfying and yummy! Yay! Love your modifications. Thanks for the feedback! What a delightful surprise! This recipe is wonderful. I was getting sick of baked salmon and decided to try this. I omitted the bell pepper because I don’t love cooked pepper and left out the dill because I didn’t have any. Delicious! My picky eater littles loved it, too! Made this tonight and it was so good! Very unique flavor. However, I soaked the cashews I had from trader joe’s in boiling water for about 40 minutes and they didn’t blend properly. It didn’t blend smoothly, but rather was like really grainy water. Any idea what I did wrong? Could it have been the cashews (raw cashew pieces from TJ’s)? Anyway, added a dollop of greek yogurt to my bowl and it was delish! Awesome! Do you have a Nutribullet or high-speed blender? If you blended it for a while and it still didn’t turn into that super smooth and creamy cashew cream, the blender likely isn’t cutting it. I highly recommend getting a Nutribullet since it’s so affordable and works so well! I made this today and it was so good. I didn’t have any potatoes or bell pepper and the onion we bought was rotten, but it still worked out. I added some chopped frozen broccoli for more bulk and added some dried chives. I blended the cashews with my immersion blender and while they seemed a little grainy on their own, the soup was smooth and creamy. Also added a little freshly ground nutmeg. My husband had 3 bowls. Can’t wait to try again with all the ingredients! Relatively easy to make for such great flavors! And…it was delicious and enough for two very filling dinners with the onion, red bell pepper, and potato. We added some coconut bacon as a garnish. Yum! Excellent recipe! I didn’t have the corn, but it was still delicious! Thanks! I’m so glad you loved it, Mary! Yummm I’m so glad you enjoyed it! My husband is lactose intolerant, and I LOVE chowders, so this is the first time we could both enjoy an exceptional chowder: simply delicious. I didn’t miss the milk/cream at all, and the cashews were a brilliant substitution. We ate heartily and healthy, and we both thank you for this addition to our recipe staples. We’ll return to this for years to come. I did use fresh salmon (so worth it), and it cooks almost immediately once added to the broth. Thanks again for delicious recipe. Isn’t it awesome how quick the salmon cooks? So happy you found a soup you and your husband can enjoy. My husband and I LOVE this chowder and I’ve made it several times. I was wondering if you’d heard of anyone substituting clams for the salmon? If so, would you be able to make a recommendation about how to pull off this substitution? I love clam chowder and it seems like to would work?! Simple and tasty, what else I could want? I told you, your fashion sense of humor is really great and you are sharing some really cool dresses with your audience. Trust me girls are dying for such stuff but the cost is going to shutd own their dreams in matter of time. This looks delicious and I can’t wait to try it. I’m curious if I can use almonds instead of cashews? Hmmm I don’t think it would have the same effect!